TROOPER takes its name from the Iron Maiden song which is inspired by the famous Charge of the Light Brigade. Being a real ale enthusiast, vocalist Bruce Dickinson has developed a beer which has true depth of character. 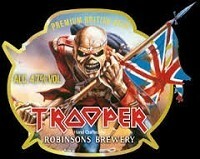 TROOPER is a Premium British Beer inspired by Iron Maiden and handcrafted at Robinsons brewery. Malt flavours and citric notes from a unique blend of Bobec, Goldings and Cascade hops dominate this deep golden ale with a subtle hint of lemon. 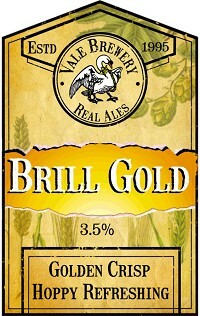 A GOLDEN SESSION ALE MADE FROM THE FINEST MARIS OTTER MALTED BARLEY AND ENGLISH HOPS. THE FULL MALT FLAVOUR IS WELL BALANCED WITH FRUITY, SLIGHTLY CITRUS HOP AROMAS AND SOFT BITTERNESS. 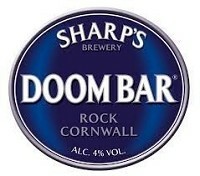 Sharp's Brewery based at Rock in Cornwell is a modern brewer of cask conditioned beer. Since its foundation in 1994 the Brewery has grown rapidly to become the largest brewer of cask beer in the South West and brewer of Doom Bar, one of the UK's fastest growing beer brands. Where the river Camel meets the Atlantic Ocean on Cornwall's rugged north coast, a sand bank, centuries old, known as the Doom Bar protects and calms this beautiful estuary. Sailors respect the Doom Bar knowing it to be unforgiving if met with haste or arrogance. Doom Bar the beer embodies many characteristics which make it worthy to carry the name of this natural wonder. It's distinctive aroma and balanced flavour set it apart from other beers taking unsuspecting first time drinkers by surprise with its moreish appeal. Doom Bar has achieved international cult status, is one of the fastest growing beer brands in the UK and the best selling cask beer in the South West of England. Taste Notes Stuart Howe Head Brewer. The South West's Favourite Regional Cask Ale for the second year running - Publican's Choice Awards. 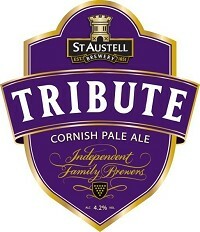 A Cornish Pale ale. Light, hoppy, zesty and easy drinking.